When it comes to any home maintenance project, it is important to take a well-rounded approach. When you need your windows cleaned, our Gorillas are the whole package! Our Coquitlam window cleaning comes with all the tools and knowledge that you could need. Why Go With A Gorilla? Giving your windows a wipe down might clear away surface dirt but a proper cleaning takes technique. Basic practices, such as the classic combo of paper towel and basic cleaners, achieve a superficial clean but brings on other issues. The wiping motion against the glass creates a static charge that attracts dust and dirt. What is the point of cleaning windows, only to find them dirty moments later. Property maintenance is not a ‘one size fits all’ industry. Whether you have a residential or commercial property, our Gorillas can help you out. Our Coquitlam window cleaning caters to the needs of your individual property. By adjusting our services directly to your space, we can provide the best results possible. Cleaning off every window on your property takes a lot of time and a lot of effort. Don’t bother breaking your back, bending low or your elbow, wiping back and forth. 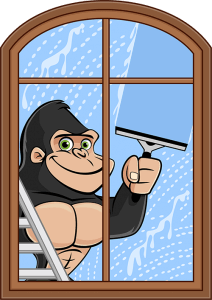 Our Gorillas have our Coquitlam window cleaning service down to a science! By utilizing all the proper tools and training, your Coquitlam roof cleaning does not need to be a chore! Our Gorillas clean windows by hand, making sure to leave every corner clean and streak-free. Gorilla services cover windows, inside and out, up to four storeys, all from the safety of the ground. How can we reach those heights? Each of our Gorilla mobile vehicles come with top-tier tools of the trade, including water-fed poles. This allows our technicians to work without compromising results – all from the safety of the ground.